Show your colors by stepping up for your community. 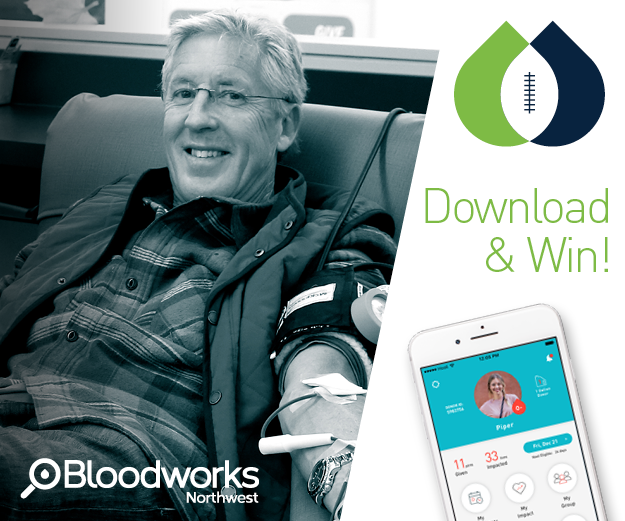 Download the new Bloodworks App and be entered to win 2 tickets to see your favorite Seattle football team! Promotion lasts October 1 – November 29, 2018. Download the new Bloodworks App and create an account. With the new Bloodworks App, you can easily find and schedule a donation from your phone, see you donation history and blood type, and learn about new donor perks. That’s it! You are automatically entered to win 2 tickets to the following games. Pro Tip: Share with your friends and family to participate! If they win, they’ll need someone to go with! Download on the Apple or Google play store or click here.